History, we all know, is written by the winners. So little wonder that in 2008, Pittsburgh celebrated the 250th anniversary of the British seizing control of the Point. True, the French had already abandoned Fort Duquesne, their installation there. As George Washington told his superiors, "The enemy, after letting us get within a day's march of the place, burned the fort, and ran away by the light of it, at night." Washington attributed the victory to "the weakness of the enemy, want of provisions, and the defection of their Indians." Still, the British conquest ensured that Pittsburghers would forevermore be speaking English (sort of). The British built their own fort, from which Pittsburgh took shelter and its very name. But consider the events of 1758 from the French side. For years, they'd thwarted British attacks with the help of Indian allies. But in the end, the English were simply too numerous, had too many resources. And so the French had to give up. 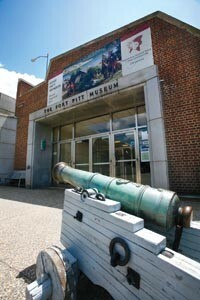 The entrance to the Fort Pitt Museum. Donn Neal, who lives a musket ball's flight from the museum, in Gateway Center, has some idea how the French felt felt. 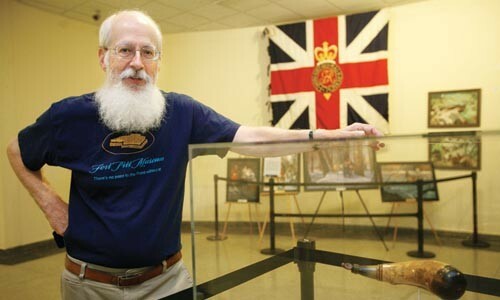 A retired historian whose credentials include a stint running the Society of American Archivists, Neal is the head of the Friends of the Fort Pitt Museum, which contributes time and money to support the Point State Park facility. When the Pennsylvania Historic and Museum Commission announced plans to close the museum earlier this year, Neal thought he could save it. "Why would you ever give up such a pivotal historic site?" asks Neal, who sports a snowy beard that itself seems like a throwback to an earlier era. But it now seems certain the state will give up the Fort Pitt Museum. While the state will retain ownership of the building and its artifacts, it is poised to turn over daily operations to the Senator John Heinz History Center. Neal and others aren't sure about the Center's plans, and Heinz executive director Andy Masich declined to answer specific questions about Fort Pitt's future. "We're still in negotiations," Masich says. Those should wrap up in a few weeks, he says, "And then we'll be able to talk a lot about all the things we have planned." But for now, one thing is clear. Much like the English 250 years ago, the History Center has superior resources. And like the French, Neal and his allies say they are badly outgunned. "This is almost a case of history repeating itself," says museum volunteer Mike Homza. "We know the area, we know the natives. But the new British administration is telling us, 'No thanks.'" A scale model of the original fort in its entrance hall. Made up of five defensive "bastions" and occupying much of the Point, Fort Pitt was once the American frontier's most extensive military outpost. Its heyday came in 1763, when the star-shaped fortification fended off an Indian uprising. 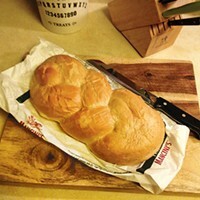 In later years, though, it fell into disuse. Its bricks and lumber were sold off; eventually, the site became an urban slum. Civic leaders tried to address that problem by opening the Fort Pitt Museum in the late 1960s, as part of the city's ongoing urban Renaissance. But while one 1969 newspaper headline asserted "Fort Pitt Museum Stirs Pride," early results were mixed. 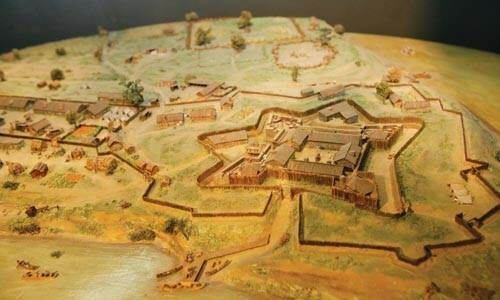 Originally, the museum told the Fort Pitt story with scale-model dioramas. The most impressive was a 15-foot-diameter reconstruction of the Point, still used today, which conducted a virtual "tour" with spotlights and a prerecorded tape. The museum also featured life-size dioramas, like a fur-trapper's cabin and an underground "casement" where munitions were prepared. But the museum was always flood-prone, and it was always easy to overlook. The bunker-like structure huddles beneath the Fort Pitt Bridge, squatting just past the far side of a darkened park underpass. As for the Indians? The museum's take was perhaps best conveyed by a diorama which showed an Indian poised to bash in the head of a teenage settler, while his blonde mother and sister looked on in horror. They don't make exhibits like that any more, and most curators would say that's a good thing. In 2000, the museum built a new second-floor exhibit space -- high enough to avoid flooding -- which took a more nuanced approach. One interactive exhibit prompts visitors to guess the number of whites killed in the "Top Ten Greatest Native American Victories." But another gallery discusses the deliberate use of smallpox -- germ warfare -- to wipe out Indian settlements. Donn Neal, with an 18th century powder horn used at Fort Pitt. "They've done a great job of making it less ethnocentric," says Charles McCollester, an Indiana University of Pennsylvania history professor. The trader's cabin is still there, near a life-size barracks and casement (though the hand of one munition-maker mannequin has been repaired with packing tape.) And the collection includes great finds like a 1777 letter from Patrick Henry, urging a subordinate to defend Pittsburgh against the British as if it were "the bulwark [sic] of your country." But today, the museum's greatest asset might be guys like Mike Homza. A couple dozen times a year, Homza heads down to the museum bearing a musket, a woolen uniform and the trappings of a mid-18th century French soldier. Homza teaches school kids about the era's way of life, and explains how phrases like "going off half-cocked" have their origins in military jargon. But the main lesson, he says, is "to teach them that one person in the right place and the right time can make a difference." In museum parlance, Homza is an interpreter. Many museums use them, including the Heinz History Center from time to time, but Fort Pitt Museum relies on them heavily. During the school year, two or three different classes might take field trips to the museum on any given day. "There is nobody around who can create an exhibit the way the Heinz can," Homza says. "But there's no exhibit that can teach the kind of things that we teach." 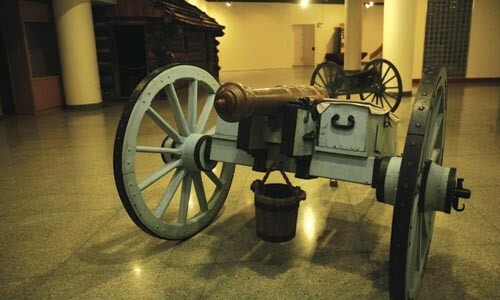 One of several cannons on display at the museum. Even so, too few visitors have been inspired the way Homza was. "I hear people say all the time, 'I was there on a school field trip, and have never been back since,'" admits Donn Neal, the Friends of Fort Pitt Museum director. 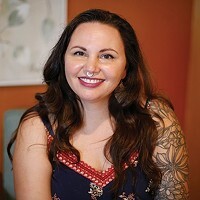 And while the Point "is sacred ground, it's hard to get parking," notes Jamie Pennisi, who worked as a docent at the museum in the mid-to-late 1990s. So when the museum's owner, the Pennsylvania Historic and Museum Commission, began reviewing the status of its 22 facilities in late 2007, one could hear the tramp of enemy boots. That review began before the current economic collapse, says Steven Miller, who heads the PHMC's Bureau of Historic Sites and Museums. "Even then, our allocations were very limited," he says, and bureau staff began assessing which facilities were financially sustainable. But the work took on new urgency when the state's budget crisis hit this spring. Released in February and titled "Planning Our Future," the PHMC report was supposed to be followed by community discussions. But suddenly, Miller says, "We needed to take action" and prepare for massive cuts. As the PHMC report argued, since the museum was built, the state spent roughly $500,000 on the museum each year, and its story could be told by other entities: the Heinz History Center, for example, and the nearby blockhouse. Point State Park had increasingly focused on "more active use of the park for concerts and events. These events ... often relegated the museum's role to that of 'restroom.'" The report's recommendation: The upstairs gallery could remain as part of a visitor's center, but valuable artifacts would be moved out. The museum's staff -- made up of five full-timers and five part-timers -- would be furloughed. Staff contacted by City Paper declined to speak, citing the uncertain future. But Neal was thunderstruck. The Friends, he says, had purchased artifacts for the museum "assuming the state would always be there." He was also upset that the PHMC cited an attendance figure from the 2007-08 fiscal year -- a time when Point State Park was being renovated and almost totally inaccessible. The museum had only 8,575 paid visitors during the study period: In an average year, Neal says, attendance is usually in the mid-20,000s range. What's more, the report recommended keeping other facilities open, even if they drew smaller crowds. Hope Lodge, a Quaker site in Montgomery County, had a paid visitation of only 1,442 -- but "Planning Our Future" recommended keeping the museum open while "explor[ing] alternatives." Similarly, the PHMC recommended keeping open the Somerset Historical Center, which drew just 9,270 visitors. The PHMC "is keeping things open that have had less visitation," says state Sen. Jim Ferlo (D-Lawrenceville), a member of the PHMC board. "As an activist, I might be a little suspicious." Other museums will be shuttered by the PHMC plan as well (though the plan won't take effect until the state's budget impasse is resolved). "No one wants to lose their job, or to see that happen," Miller says. But "only Pittsburgh created a conspiracy theory so extensive that we're talking about it today." Attendance figures weren't the only factors the PHMC considered, Miller says. Some museums, he says, are the only cultural amenity in the region, so low attendance numbers may underestimate a facility's significance. Fort Pitt, by contrast, has long struggled for recognition in a city with many cultural offerings. For the sites the PHMC plans to close, Miller says, "It was sometimes very difficult to determine who their supporters were." Still, hundreds of supporters turned out when they heard news of Fort Pitt's closing: Membership in the Friends of Fort Pitt grew from fewer than 100 to more than 700. And Neal began crafting a plan to have the Friends save the facility. 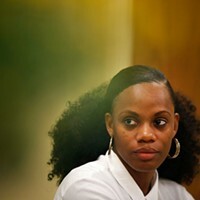 Under that proposal, Neal would serve as an interim, unpaid executive director. At least three of the museum's current staff would remain. Director of Visitor Services Karl Smith was willing to work at no cost, while others would take pay cuts. The museum would redouble promotional efforts -- which had lagged under state control -- and Neal predicted it could attract 30,000 paid visitors and $150,000. The PHMC would support operations with a $100,000 payment, and review the arrangement after a year. If the Friends succeeded, Neal had plans for extending activities into the surrounding park. The plan was credible, at least. Neal had backing from staffers, volunteers, historians and people like Linda Dickerson, a respected business leader who helped engineer a turnaround at the National Aviary on the North Side. And PHMC is turning over other facilities to similar groups elsewhere. Soon enough, though, Neal no longer believed the PHMC was looking for an excuse to close the museum. The truth, he thought, was even worse. "They were never going to close the museum," Neal says. "This was a set-up from the beginning." 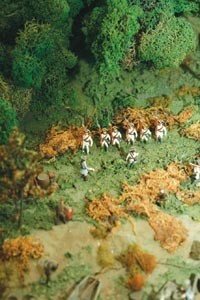 British soldiers await orders in a museum diorama. When Neal first heard that the Heinz History Center was seeking to run the museum, he says, "We thought there would be a competition. But our proposal was never taken seriously." City Paper obtained a copy of the History Center's proposal. Under it, the state would provide roughly half the funding it does today -- $250,000 a year -- for the next five years. The History Center would use its own staff to reduce operating costs. (The effect on current museum staff is unclear: The History Center proposal speaks only of "a reorganization of staff," and Miller says such personnel issues are confidential. Heinz spokesman Ned Schano says that if the deal goes through, current employees are "encouraged to apply for any open position" in the museum.) The $7 adult admission would be cut to $5, while the Heinz Center would leverage its own marketing skill to improve Fort Pitt's visibility. To attract attention, the center would also install "a large garrison flag [to be] lit 24 hours a day" outside the museum. After five years, the Center estimates, visitation would be 50,000 people per year. The Center would also create a "Fort Pitt Museum Committee" to oversee the changes, which the Center promises will be great, even if they can't be disclosed. "A rejuvenated Fort Pitt Museum is good for the entire region," says Heinz Center spokesman Ned Schano, and will "further establish Pittsburgh's crucial role in early American history." Neal notes that the History Center is seeking more state support than he is: "There's very little savings to the state," he says. And with operations dependent on History Center staff who are already working full-time, Neal fears Fort Pitt will get short shrift. But Miller says the History Center has a critical advantage: "You either go with a veteran, or with a rookie." As for the Friends proposal, "We admired it for its hopefulness," but "it was highly idealized. Their predictions for visitation were aggressive. The economic times don't predict a high degree of success." That makes sense to Ferlo. The Heinz Center has "a CEO, and plethora of programs," he says, while volunteer organizations "can wax and wane." To Linda Dickerson, though, the PHMC merely made the "safe bureaucratic response: Turn it over to a credentialed institution and be done with it. A History Center takeover "won't be a disaster," she adds. "I just rarely vote against a capable body of individuals who have passion about something that matters. But I think the decision was to give the museum to the History Center months ago." In fact, a June 1 Pittsburgh Tribune-Review story asserted the "History Center has been negotiating with the Pennsylvania Historical and Museum Commission for about five months to take over operations of the site." Masich didn't answer questions about when talks began, but Miller says his first conversation with the History Center was in mid-March. "There were no inside deals," he says. 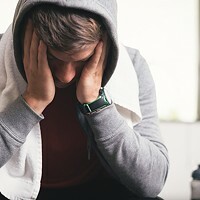 "In any industry there are casual conversations between people about what's new," he allows, but, "There were no conspiratorial sessions to set this up." As a PHMC board member, Ferlo has urged that any operating agreement with the History Center include the Friends. But it won't be easy, he admits. Masich has "has plenty of ability, but he can rub people the wrong way. And Donn can be hard-headed too." Miller says that the state and the History Center will be ready to ink an agreement once the state budget crisis is resolved -- but he doubts a role for the Friends will be written into it. "I don't know if you can make people be friends," he says. Indeed, while the History Center proposal says it "would welcome the continued and valued support of the Fort Pitt Museum volunteers," it barely mentions the Friends in its plans, except to promise that members will still get free admission. The History Center proposal talks of partnering with the Daughters of the American Revolution and other groups, but the Friends are conspicuously absent from the list of partners. "Andy Masich has made it abundantly clear that he doesn't want another [non-profit] there," Neal says. Part of the dispute, Neal says, is philosophical. "Everyone knows Andy is a great promoter," says Neal, who has worked as a volunteer at the museum. "But the Heinz Center is like a department store -- we're like a boutique." Not everyone thinks that's such a good thing. Jamie Pennisi has worked both at the Fort Pitt museum and in the Heinz History Center, where he helped curate the center's own French and Indian War exhibit, Clash of Empires. While he doesn't work for either institution now, "all I can say is things have probably worked out for the best." Pennisi says "it's tough to find French and Indian War artifacts," so the museum features a lot of wall-text instead. It's "focused on the scholarly approach," Pennisi says, and "the visitor with kids in a stroller isn't going to read all that." Masich, he says, has a strong background in "giving people reasons to come back, which is something scholars can forget." Some Friends of Fort Pitt take pains to say they like Masich personally. "Andy is a brilliant person," says Ren Steele, a Friends member who stages history-themed plays at the Freeport Theater Festival. "Either Donn or Andy would do a good job running the museum. But it has to be one or the other." And there's the rub. As Dickerson puts it, "If you looked up the phrase 'irreconcilable differences' in the dictionary, you might find a picture of Andy and the Friends there." "The History Center looks like a massive monster gobbling up this tiny museum," Pennissi says. The Friends have not been in on discussions over the operating agreement. They're "in the dark," he says, even though without them, "The History Center isn't going to be able to recreate their expertise on its own." "There needs to be some diplomacy," Pennisi adds. The museum's newer exhibits take a more sympathetic look at Indian culture. Of course, if diplomacy were easy, there might not have been a Fort Pitt in the first place. The Fort Pitt Museum's second floor welcomes visitors with a brief film, titled "Whose Land?" that explains the motives of the three parties seeking control of the Point. "Whose land?" the film concludes. "The answer was still another war away." If only it were that easy. Part of what drives the debate over the museum is that the Point itself is still contested. Once a fort and then a fledgling village, the Point became an industrial-age slum. The city's postwar Renaissance turned it into the city's front lawn -- thanks partly to a fire that broke out in an abandoned railroad terminal. "Every time the Point is claimed, it's done with fire," says Lynn Squilla, a community activist who has worked on historical projects dating to the French and Indian War. "And whoever controls the point, controls Pittsburgh." Those debates are what has driven history, she says, and she worries that "there not be a monopoly on the past." As it is though, the Point and Pittsburgh alike suffer from an identity crisis. Earlier this year, state agencies released a "Point State Park Interpretive Plan" which noted that "Although the Point is an iconic site, [it] lacks a clear and cohesive identity." It is, after all, both a historical site and a concert venue, a green space and a place to toss a football. That hasn't done any favors for historical interpretation. Mike Homza says that if you try to recreate frontier life outside the museum's walls, "There's a good chance you're going to have a Frisbee land in your dinner." But now civic leaders are revising the history they wrote four decades ago. Today the direction is being set by the Riverlife Task Force, a public-private entity that seeks to reconnect Pittsburgh to its rivers. Riverlife's plan for the park emphasizes environmental and recreational amenities, consistent with a city whose Downtown went from industrial powerhouse to sterile office park, but now boasts of an environmental rebirth. One sign of the new trend is the fate of the "Music Bastion," a zig-zagging trench gouged into the lawn near the museum. The bastion was excavated during a 1960s architectural survey. Rebuilt with stone apparently used in the original fort, it was the only way most park-goers could see how large the fort had been: a mysterious-yet-tangible reminder of Pittsburgh's beginnings. Yet it was filled in during the park's recent renovation. 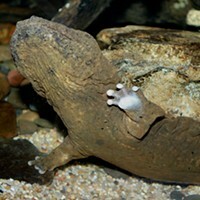 Riverlife cited several reasons for doing so. The bastion's authenticity was dubious, for one thing. And leveling the lawn near the city would also allow music events to be held on the parkland closest to the city -- reducing the damage big crowds do at events like the Three Rivers Arts Festival. The state's "Interpretive Plan," meanwhile, envisions plenty of history-related programming, including the use of interpreters like Homza for special events. The park may also include self-guided audio-tours, "holographic images or projected images under the water in the reflecting pools, on walls, etc." It's hard to argue with many of those plans: As Riverlife's plans for the Point make clear, the area was closed to bicyclists, and for a park located at the confluence of three rivers, it's almost impossible to actually "touch the water." Some of that was the legacy of the park's original conception as a historical monument. But some worry that in all the changes, Pittsburghers are losing a chance to experience history in the flesh. In burying the Music Bastion, officials "were looking at the desires of the Riverlife Task Force, and forgetting about the historical implications," says Wil Rouleau, who co-founded a group that tried to save the bastion. Rouleau sees a similar dynamic today: "I'm very disappointed that the Friends of Fort Pitt were left out in the cold." The history center represents some of the same high-powered civic interests, he says, and "Once again, historical aspects are being made secondary." "I think when the bastion was filled in, that was a dark day in Pittsburgh's history," says Roger Kirwin, of Old Bedford Village. "I understand why they did it, but the bastion gave an idea of the size of the place. Kids could learn just from climbing it." Such experiences naturally appeal to Kirwin, whose re-created colonial-era site offers interpreters like Homza against a historic backdrop that is "like being on a movie set." And he says Pittsburgh still lacks a sense of its historic bearings. 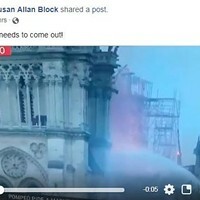 During last year's 250th anniversary celebrations, he says, "the fireworks displays were well attended," but more serious events drew little interest. "I think people didn't just quite understand what it was about." The way forward, he says, is not through virtual experiences, but in letting visitors "lay their hands on a log hewn 250 years ago, so they can still feel the axe marks." In fact, if Kirwin had his druthers, the Point would re-create a life-size model of Fort Duquesne, making history more tangible and permanent, rather than less. That would allow Mike Homza to dress up in his French soldier's outfit and reclaim the Point for France. But Homza thinks he's more likely to be on the losing side -- again. Unlike the French, though, "I won't blow up everything on the way out," he says. "I promised Andy."